Flexible Giving Account – A better way to make charitable donations. A better way to make donations. Open a Flexible Giving Account to simplify, manage, and budget your donations to over 2,000 nonprofits. Add funds and make your first donation in under 5 minutes. No fees, no paperwork, no pledging, and complete privacy. It's the way giving should be. Your generosity just got empowered. Find the freedom to give in a way that works best for you. From quickly making a single onetime donation to setting up several automatic budgeted donations, take advantage of the features that'll simplify your giving. 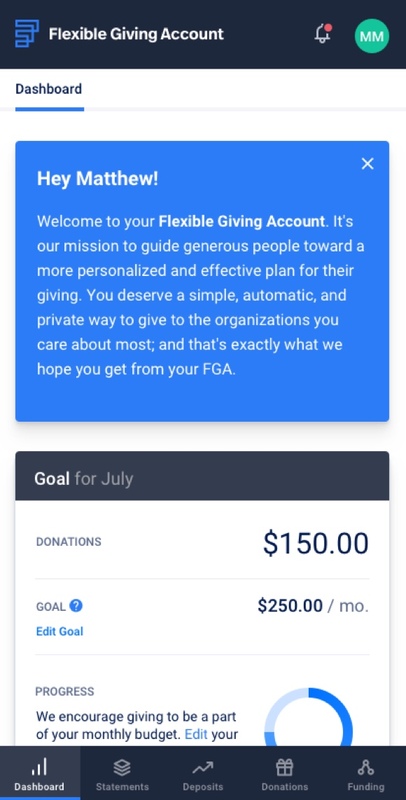 Setup recurring donations to any nonprofit, and schedule them to automatically process from your bank account or debit/credit card on the 1st or 15th of each month. All with the freedom to modify your giving budget or disable automatic donations at your convenience. There's no need to rely on an nonprofit's specific method of collecting donations, or searching for an address to send a check. Easily make a private, one-time donation to any nonprofit using a credit/debit card or bank transfer. Keep track of your monthly giving budget by summarizing all of your donations in a simple, printable statement. And because we're organized as a nonprofit and donor advised fund, you can use our year-end giving statement as your entire tax-deductible receipt. Donate to a specific cause, and we'll distribute your funds to the nonprofits making a difference in that world. From children and restoration to international and local impacts, our mutual giving funds are a simple way to give to a cause you care most about. We're giving employers the power to automatically deduct charitable giving from your paychecks, match your donation amounts, and deposit funds directly into your Flexible Giving Account. You then choose which nonprofits to donate the money to. Giving should be private, flexible, and free of guilt. So we vow to never share your contact information or donation activity with any nonprofits. We distribute 95% of all donations directly to nonprofits each and every month, no matter how big or how small the donation. We are currently focusing on the Sioux Falls, SD area.